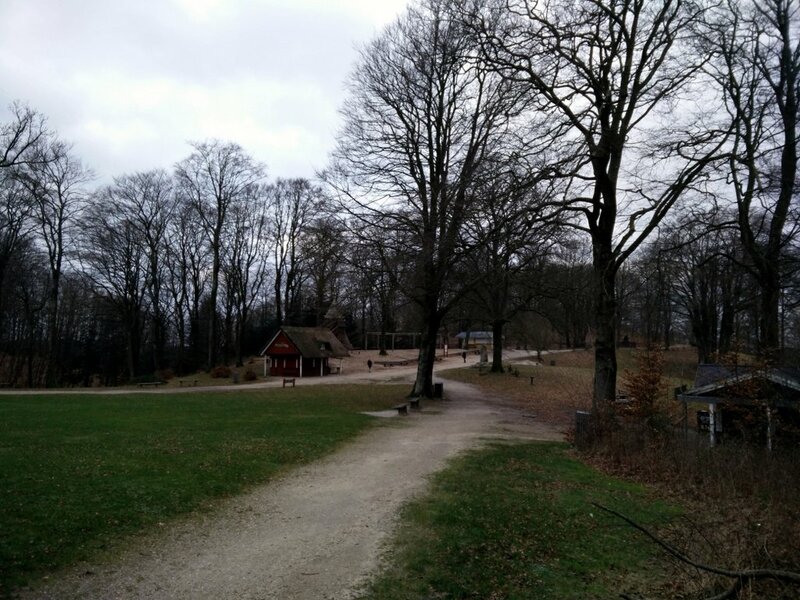 Himmelbjerget is an around 148 meters high mountain in Jutland in Denmark. In December 2015 I concluded my “Hiking Iceland” tour and then stayed in Denmark for some time. Denmark is quite flat and therefore I was skeptic that I could find a tempting mountain to climb over there. 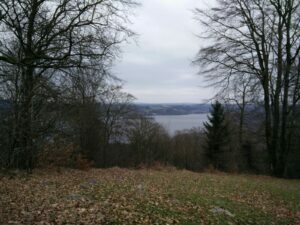 However, after doing some research on the internet I came across Himmelbjerget – the second highest mountain in Denmark. The Himmelbjerget lies in the area called Søhøjlandet between the towns of Silkeborg and Ry. 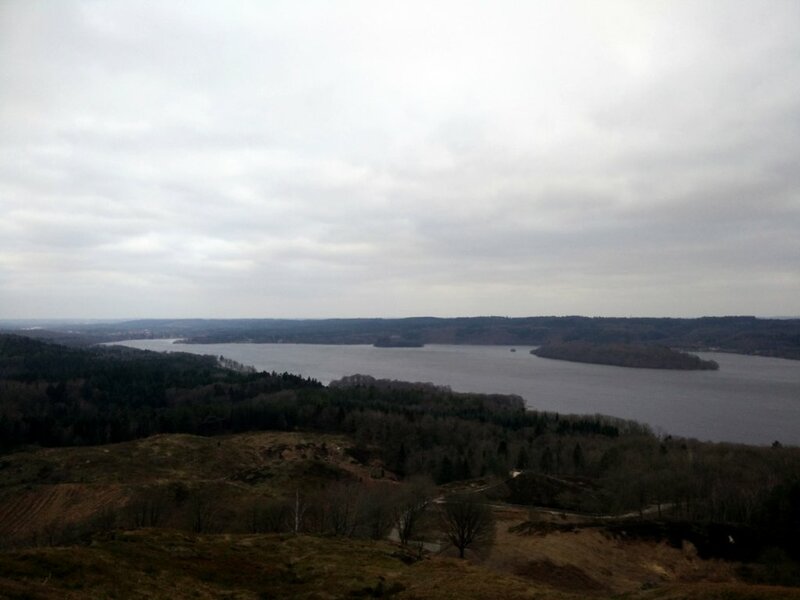 It’s a very small mountain but as Denmark is extremely flat, it offers a great view on the surroundings. There are several ways to reach the top of the mountain – including an asphalt road for cars which makes it accessible also for those who don’t want to hike. In the summer time there are boat routes from both Ry and Silkeborg which takes you to the foot of the mountain. For my cold January ascend I decided to approach the mountain from Ry by hiking on dirt tracks, away from the trafficked roads. If you are travelling by public transport (from anywhere in Denmark), the easiest thing is to use rejseplanen.dk in English where you simply type in your details and the page finds the fastest connections for you at the given time. As destination you should write “Munkedalsvej 2, 8680 Ry”; the page will most likely direct you to take bus or train to Ry Station and then you’ll have to walk 1,5 kilometers to the starting point. The starting point for this trail (and above attached GPS route) is at the small parking place on Munkedalsvej – a dirt road just off highway 445, a kilometer after leaving the town of Ry and crossing the river Gudenåen when approaching from northeast. If you are driving along the busy E45 expressway, you will get off it at Herningmotorvejen and drive on expressway 15 towards Herning and Silkeborg for 14,5 kilometers. Then get off at exit 24 Låsby and follow the signs toward highway 455 and Ry, through three roundabouts in the course of 500 meters. After the third roundabout you will be on highway 455 which you will follow until you enter the town of Ry. 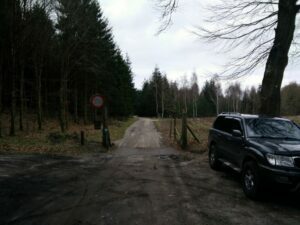 As you drive through Ry, you should follow signs towards Himmelbjerget and road 445 towards Rodelund (NOT Skanderborg!). On the other side of Ry you will cross the river Gudenåen and approximately 1km after crossing the river, Munkedalsvej will come up on your right. Park there and lace up your boots! The trail is relatively flat and well-marked, and therefore I believe that everybody can execute this pleasant and easy-going hike. From the parking place continue on a wide dirt track towards northwest, regularly marked with red dots on little wooden posts. 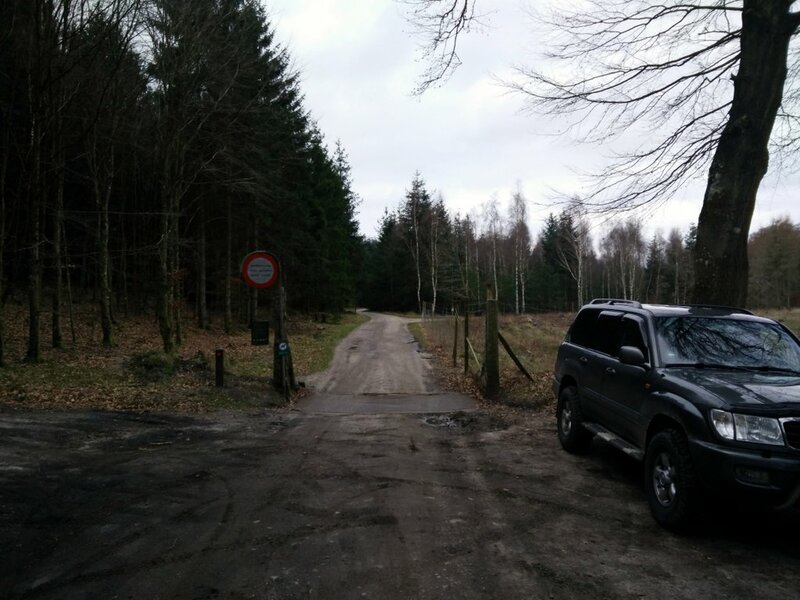 Even though this track is wide enough for cars, it is only allowed for the few people who live along the track – just in case that you would be considering to drive close to the mountain along this road. 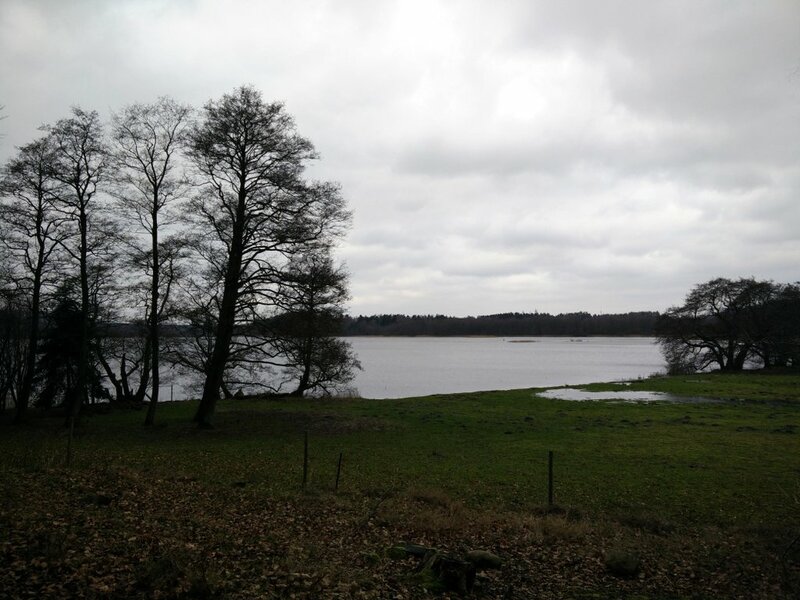 After walking for approximately 400 meters you will reach the southern tip of the Birksø lake and walk along it towards southwest for a while. I think that this is a great place for relaxation and hanging out in summer as the nature is beautiful and docile. But in January when I was doing this hike, it was simply too cold and windy to be still for more than couple of minutes. There are several narrow side paths that join the wide dirt track on the way but you should ignore them and stick to the main track which soon changes the direction towards north. After hiking for approximately 3.5 kilometers on the wide dirt track you’ll reach a bigger crossroad. Here you should get off the wide dirt track and continue on the much more narrow path towards west as marked. The crossroad as well as the whole Himmelbjerget trail is well marked with wooden posts and thus I think you shouldn’t have any problems with the navigation. From there on the path starts gently ascending. 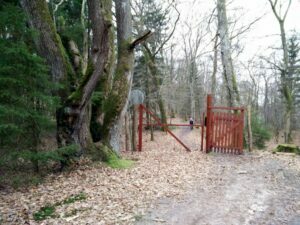 Soon you will arrive to a fence with a big wooden gate, which you should walk through. 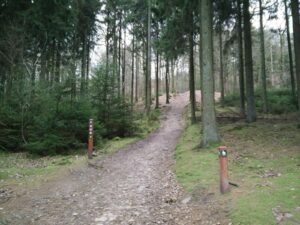 The path is now marked with yellow dots instead of red; you just follow them and the signs for “Himmelbjerget”. Shortly after, you will start ascending the mountain itself from the northern side. The path becomes narrower, rockier and steeper – you will rapidly ascend 125 meters. In wet conditions (as they were in January) the path can be very muddy and therefore I would recommend you to wear a pair of decent waterproof hiking boots. In dry conditions you should be okay with comfortable trekking shoes. 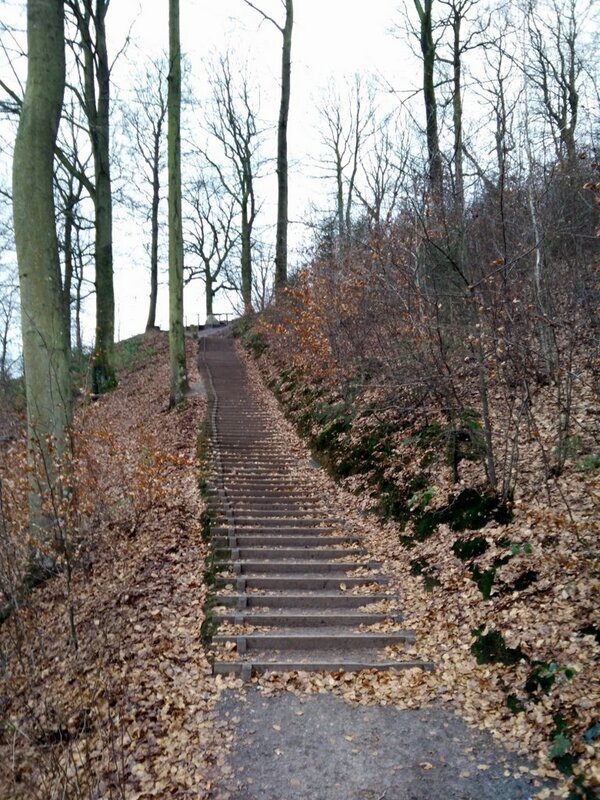 Just before the top of the mountain you will reach the stairs over which you ascend to the Hans Christian Andersen bench. Next to the wooden bench which has a great view on the Julso lake and the woods nearby, there is a big boulder with the inscription: “In Denmark I was born/Here is my home/Here my roots are/From here my world starts” by the famous Danish author who wrote well-known fairy tales such as The Emperor’s New Clothes and The Little Mermaid. After the memorial stone there are just couple hundred meters of hiking left to the top of the mountain. 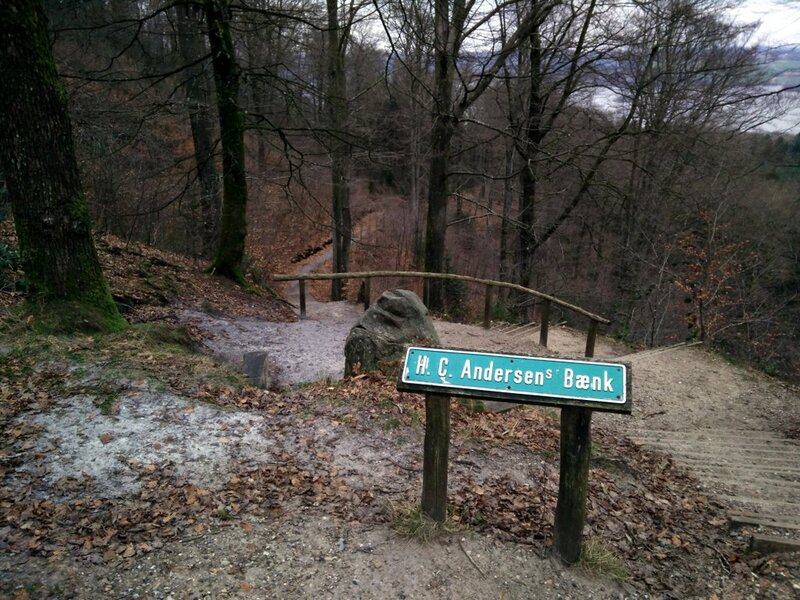 First you will reach the Himmelbjerget restaurant and souvenir area with a spectacular playground for kids. It is also here that the asphalted road for cars ends. 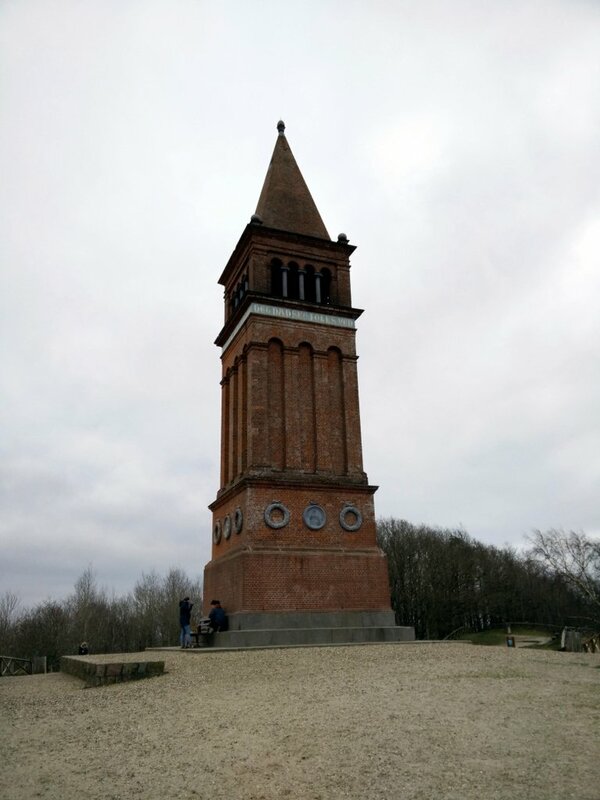 You should walk past all of this to reach the top of the mountain – which is marked with a 25 meters high red brick tower and from there you’ll get a great view on the Slikeborg lakes and forests. In January the tower was closed but when it is open, you can get a great undisturbed view of the entire region. The entrance fee is 5 kr. per person – less than 1 euro/dollar. As I didn’t find any attractive alternative route that would lead back to the starting point (besides the asphalt road) I used the same route for the way back. As the weather forecast showed low temperatures (-2 C) and strong wind (30 km/h) I wanted to be decently equipped for this hike. I was wearing a synthetic Under Armour t-shirt, Polartec fleece jacket, Carinthia HIG G-Loft jacket, windproof Schoeller AB400 pants, mid-length Salewa hiking boots, socks made of Merino wool, synthetic gloves and a Woolx hat. In the Osprey Talon backpack I was carrying additional thermal clothing, water, food and some accessories. If you are doing this hike in winter I would recommend you to wear warm and windproof/waterproof clothing. 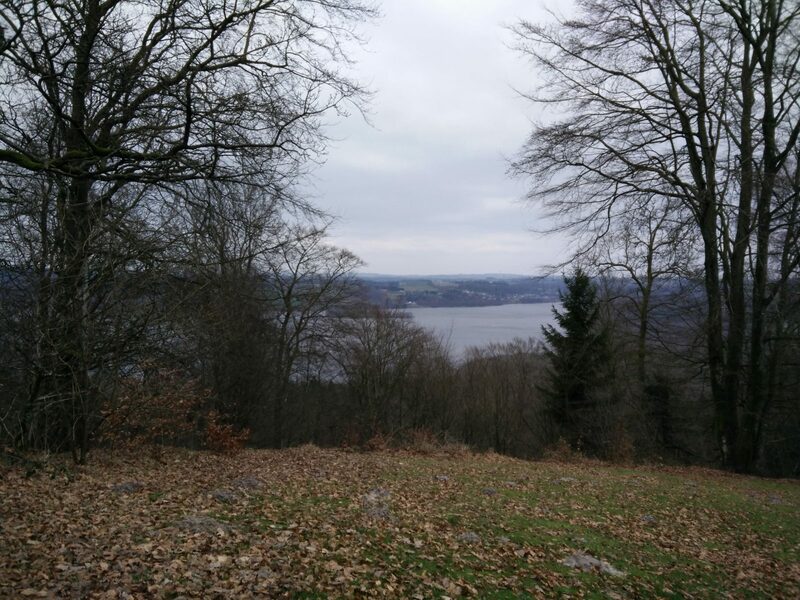 Even though Himmelbjerget is a small mountain it can be very cold and windy up there. In summer you probably don’t need that much gear but still pack a windproof jacket in the backpack as the top of the mountain is very exposed to strong winds. The Woolx Merino Wool Boxer Briefs kept me warm throughout this 3.5 hours long hike in relatively cold conditions as the strong wind made it feel absolutely freezing. The boxers are made of 100% 17.5 micron Merino wool which is excellent at maintaining the body’s natural temperature. Additionally it’s extremely soft and pleasant to the touch – thus providing great comfort. 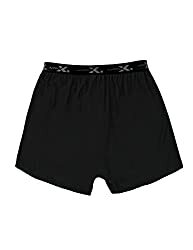 I would recommend these amazing boxers to everybody who needs comfortable moisture-wicking underwear for his hiking adventures. 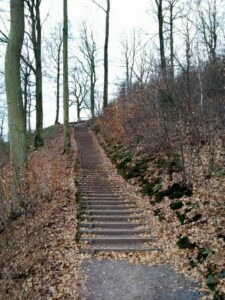 The Himmelbjerget trail is best for those who want to spend a day in the nature and in between climb a small mountain which offers a great view. As the trail is relatively flat I believe that everybody can do this hiking trip – even families with kids. However, I would recommend you to wear warm clothing and appropriate footwear – especially if you are doing this hike in winter. You will in general be walking through nice docile nature, occasionally meeting people jogging, mountain-biking or walking their dogs. After reaching the top of the mountain you’ll be rewarded with a great view on the surroundings – and maybe an ice cream from one of the food stalls.